There is a hugh restricted area over Germany, it is shown as a circle in SD, see picture. Inside this circle the vertical profile of the airspace (mouse over) seems to be correct, but outside this circle the information of the vertical boundaries is at least incomplete. This is in the Windows version, I checked it on an iPad, and this is OK.
What is incomplete about it? Check the same airspace just inside the big circle and just outside the circle and you will see the difference. 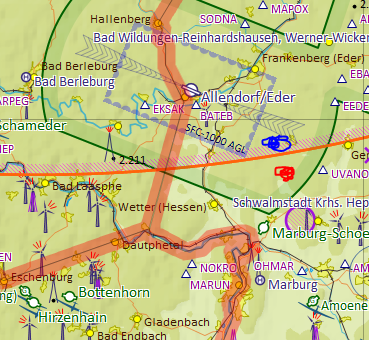 Ik looks that when the mouse points over an notamed area in Germany (check for some smaller circles) the airspace info is correct and outside it is incomplete, sometimes no info at all. Maybe, but in this case there is a difference in the stack of the same airspaces but 'measured' on different locations. I just don't get it, sorry. 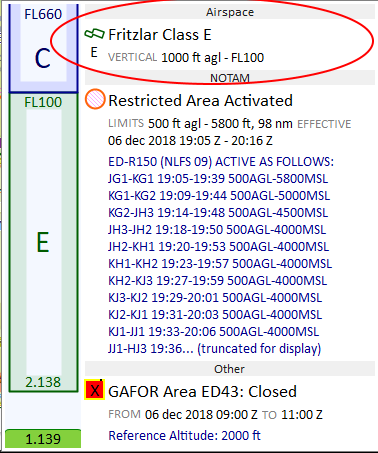 At the point of the arrow in your screenshot I can't see any airspace other than the class E, which is accurately displayed in the tooltip. This is the stack at the red location. 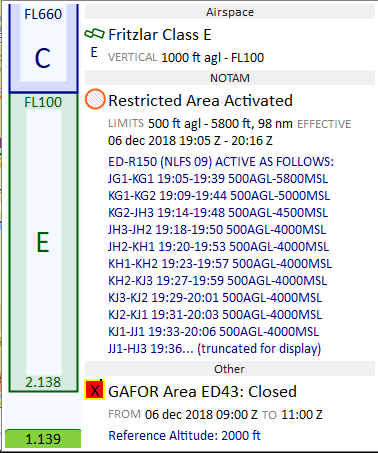 The airspace stack at both locations should be the same.It seems that the stack is different if you check within a notamed area, restricted or prohibited area and in area’s with nothing specials. Outside. The stack shows less airspace, also no upper limit of the E-airspace, which is FL100 over total (?) Gernamy. Yep, that's exactly the problem I described here. The issue is that the graphical airspace stack depends on the size of the popup window. And the popup window size depends on the textual information shown on the right. But in your case the airspace stack on the right is also missing the C airspace. Maybe you have enabled Automatic Decluttering in your planing options? No, the C airspace above FL100 is visible when pointing at the blue location and will disappear on the red location. No, it's missing on the right of the popup window in both of your screenshots. So I guess you have enabled airspace decluttering (on android the option is in the map settings and called "automatische Vereinfachung" in German language). And the stack on the left depends on the size of the popup window. If the window is too small the airspace is not drawn.